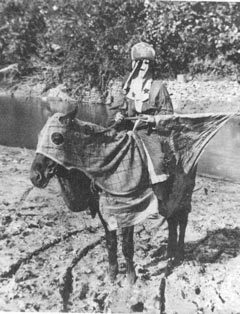 Klansman on horseback ca. 1868. Members of the Ku Klux Klan disguised themselves in hooded robes while committing criminal acts against Southern blacks and their Republican allies. Hooded horses added another element of terror. This klansman holds a banner embellished with a dragon motif and a Latin motto.